The only other book I got is Hamlet, and I actually bought it last week but forgot to put it into my haul. I need it for one of my classes, and it will be my first time reading it. Which is sort of embarrassing considering that I'm a postgrad student of English Literature. But I actively avoided the play this far - Shakespeare's tragedies are too good; they tear me up inside. Just think of Othello and Macbeth! That's why I read more of his comedies. Anyway, I got myself the Arden edition because I like their notes and introductions. I know what the play is about of course but I'm fuzzy on the details so I'm actually looking forward to reading it now! I'll get to it some time next week. I haven't been very active post wise and the main reason for that is that I was sick from Monday afternoon to Friday morning. I found it hard to focus with the fever I had and couldn't stare at a screen or book too long because my eyes started to hurt. But I posted a new review Friday night. It's for Florence by Ciye Cho, a mermaid book that I enjoyed a lot. So... thoughts on my haul? My silly face? The books (no spoilers please)? Also, happy Easter to all!! May the chocolate bunnies be with you ^^ And please share links to you own haul! Have fun with Hamlet! I think it's amazing, it's certainly not one of the more gruesome tragedies - not like Macbeth and Othello! Just... be prepared is all I'll say! Happy reading! I still need to read about the Prince lol! Been sitting on my shelf since the release day...*tsk tsk* :) Great haul! Ahhh Hamlet. One of those many plays that is so very interesting. That's why I never preorder anything online, the books might arrive late so I just wait for the release day and trudge to the bookstore myself. Also, the book I brought from the bookstore will probably also be in better condition since my mailman seems to hate me. Hamlet has a gogeous cover!!! *-* 'may the chocolate bunnies bne with you' LOL!!! I hope so. Yay for CP, hope you enjoy it, I didn't like it very much, I was disappointed. 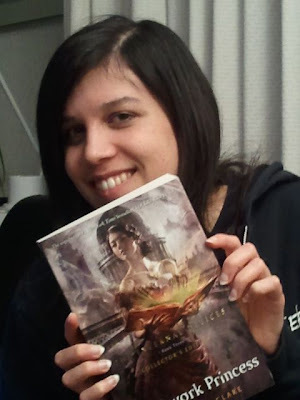 I'm eagerly anticipating my signed copy of The Clockwork Princess! Yes Clockwork Princess was so damn good! My Haul! Letterbox Love! HI! *waves at 'picture Carmen'* I had a pre-order horror story with Book Depository once. It was actually one of the newer Mortal Instruments books and I got it 2 weeks after it was released o.O didn't really see the point of calling it a 'pre-order. Oh and I hope you'll love Hamlet; back in high-school it was one of my favorites :D I hope you're feeling better doll - enjoy ALL your goodies!